OE Canada sold their copier holdings (OE Canon) and after a five-year non-compete phase re-entered the Southern Ontario marketplace in a partnership with Toshiba imaging and copiers. The theme of this campaign was to promote a dual-engine Toshiba copier that allowed high volume black and white imaging with low run colour imaging. Response created the theme: ˆHave your cake and eat it too”. To illustrate the premise, a black and white cake with a colour slice drove home the proposition. Response had custom cookies baked and wrapped for leave-behind use by the 28-person OE sales force because the first line of contact was the front desk gatekeeper. 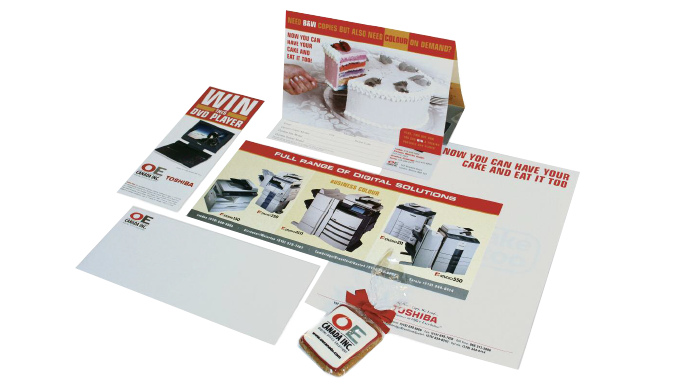 The sales journey included mailers to former OE Canon customers and leads gleaned from the OE Canada sales people.. Unaddressed admail was also used to prospect with a contest to incent lead generation. The goal of this campaign was to get a demo machine into the prospects business and during orientation on use of the machine, the sales rep brought in a branded layer cake for sharing with the prospect’s staff. Sales took off and OE Canada successfully launched into the Southern Ontario business machine market.